This week U.S.. Bancorp and the Minnesota Vikings completed the last grants of their three-year $1 million Places to Play program. “We’re excited to announce the final U.S.. Bank Places to Play grant recipients, each of which creates opportunities for kids and families to learn, grow and make memories,” said Reba Dominski, chief social responsibility officer and president of the U.S.. Bank Foundation in a news release. The Places to Play program was created in 2015 as part of the U.S.. Bank Stadium partnership announcement with the Minnesota Vikings. The grants were not limited to football or Minneapolis. 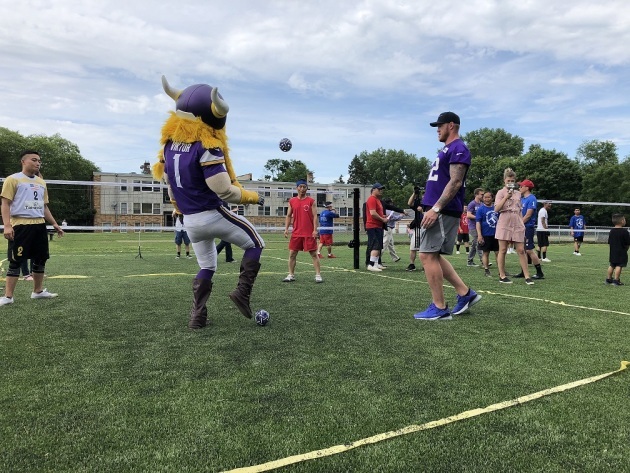 On Thursday U.S.. Bank officials and the Minnesota Vikings, Kyle Rudolph, celebrated a grant to the St. Paul Parks & Recreation Conservancy to build Sepak Takraw (Kato) courts at the Duluth and Case Recreation Center and Marydale Park. Sepak Takraw (Thai) or Kato (Laotion) is a traditional sport in Southeast Asia in which players use their knees, feet, chest and head rather than their hands to hit a ball over a 5-foot 1-inch high net. The permanent courts will be the first of their kind in the Twin Cities. Over the last three years U.S. Bank and the Vikings have made 25 grants worth a combined $1 million across the state. Two of the nine most recent grants went to the Phillips West neighborhood in Minneapolis, including a grant for the final phase of the DinoMights Billy Lindsay Outdoor Hockey Rink, a refrigerated outdoor hockey rink in the Phillips West Neighborhood. Other grants in this cycle went to Grand Rapids, Richfield, Jordan, Duluth and Walker. Examples of earlier grants included a gym improvement program at the Conway Community Center in St. Paul for the Sanneh Foundation and new community bleachers for the baseball and softball programs in Fairmont, Minnesota. The Places to Play initiative is part of U.S. Bank’s Community Possible program which is the corporate giving and engagement platform of U.S. Bank. The Community Possible programs is focused on developing stable jobs, better homes and vibrant communities that include areas of work, home and play.